A sphere is too tough for me to draw, but imagine one wrapped neatly around the cube above. If the cube has a volume of 8 cm3, we know that the sides of the cube are 2 cm each. 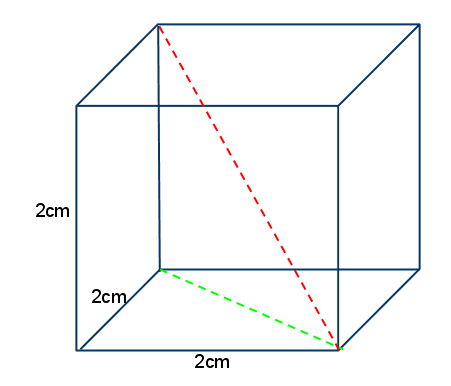 Since that cube is inscribed in the sphere, we can find the diameter of the sphere if we can find the distance between opposite corners in the cube (the red dotted line), that will also be the diameter of the sphere. So how do we find it? 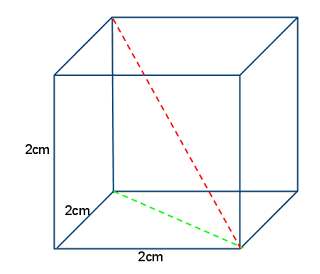 Notice that the red dotted line is the hypotenuse of a right triangle with the side of the cube (2cm) for one leg, and the green dotted line for the other. If we can find the green dotted line, we can calculate the red one. The green line is the hypotenuse of a right triangle as well, isn't it? In fact, it's the hypotenuse of a isosceles right triangle (both its legs are 2cm), so we know from the table at the beginning of the section, or from our memories, that the length of the green dotted line is 2√2 cm. Now let's calculate the diameter, the red dotted line!